The Kino Soccer Complex provides six full sized fields including a 2,250 seat stadium master planned to expand to 5,600 seats. 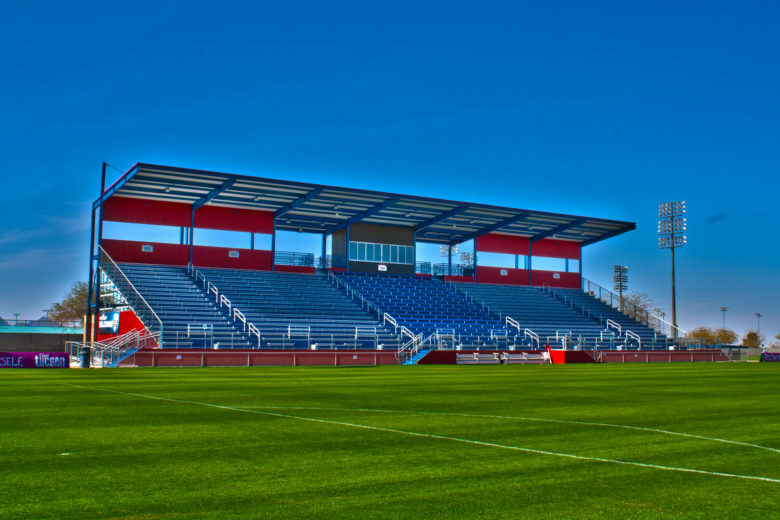 The press box, shade canopy, concessions, restrooms, ticket booth, entrance structure, field lighting, score board, and other site amenities support professional, college, and youth soccer, as well as rugby and lacrosse. The design addresses the needs of the players, coaches, fans, and maintenance staff. A fast track design schedule with master planning was used to avoid interrupting the primary events at the Complex. The design team adapted to budget driven variations in scope to maintain the schedule without add services. Marketing materials such as large format renderings and a fully rendered video were developed for public distribution, including use on the Pima County website. Swaim Associates brought their passion for youth and professional soccer as well as the desire to fully understand the needs of the maintenance, users, and spectators to develop this tremendous venue. This attitude was maintained through bid and construction while adapting to existing conditions and supporting the demanding construction schedule. This entry was posted on April 8, 2019 by swaim_admin.